STRANGE WOMAN lounges by the pool, barely paying attention to her two daughters, who appear to be around six and eight years old. The earbuds she is wearing indicate she is listening to music. DOMINIC and GIDEON and THEIR STILL-UNHAPPY-IN-HER-BATHING-SUIT MOTHER WHO IS BEGINNING TO WONDER IF SHE HAS A HORRIBLE DISEASE THAT IS CAUSING HER TO HAVE CONSISTENTLY SWOLLEN ANKLES AND A WEIRD ARM RASH enter the pool. Let’s play Friday the 13th! I’ll be Jason. GIRL NO. 2 (apparently named Jo Jo) ignores DOMINIC. MOTHER tries to read a magazine in the lounge chair across the pool from STRANGE WOMAN. MOTHER is unable to read said magazine because STRANGE WOMAN is dancing in her chair and singing along with her music. STRANGE WOMAN is not a gifted vocalist. A MAN IN A TOO-TIGHT BUTTON-DOWN SHIRT enters the pool area, pulling a wagon filled with THREE SMALL BOYS. His LARGE-BOSOMED WIFE follows. They position themselves directly across the shallow area from MOTHER. The WAGON BOYS play together in the shallow end in front of MOTHER. There’s plenty of whining with no response from their parents. A MAN and a WOMAN carrying the largest pool floats sold on the open market enter the pool area. They set up camp at the far end of the pool to MOTHER’s left. 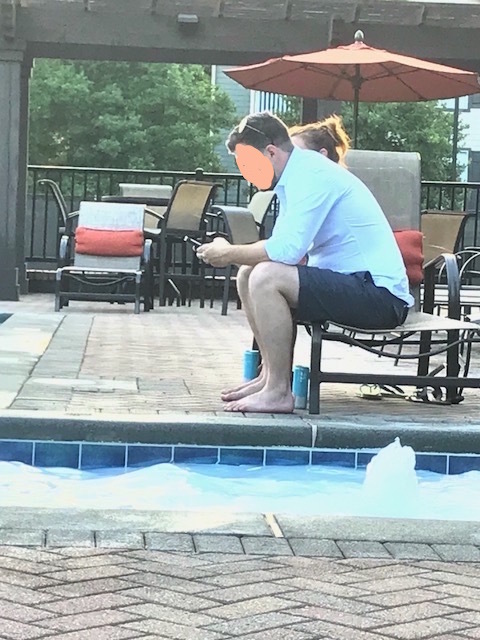 STUFFED SHIRT stands up and begins walking around the pool area while playing on his phone. MOTHER sips her thermos full of cider and watches SHIRT track a pacing circuit in front of her. Her blood boils as he repeatedly walks within one foot of the end of her lounge chair. ANGRY MOTHER marvels at the fact that there is an entire pool area, but SHIRT feels the need to be all up in her grill. BOSOM strikes up a conversation with WANNABE MARIAH CAREY while SHIRT continues to pace. MOTHER runs out of both patience and cider. Part of the joy of living in an apartment complex (even temporarily) is taking advantage of the pool. Enjoy these missives from our adventures. EPISODE 1: Is this Sun City? Two elderly women tan their already leathery bodies on lounge chairs. A girl of about six years old plays with a pool noodle in the shallow end. DOMINIC and GIDEON and THEIR STURDY MOTHER WHO IS NOT HAPPY IN HER BATHING SUIT (OR SKIN, FOR THAT MATTER) enter the pool. SPLASHING commences. MOTHER drifts close to ELDERLY WOMAN NO. 1. MOTHER emphasizes “tub” as in the SNL The Love-ahs sketch with Rachel Dratch and Will Ferrell. ELDERLY WOMAN NO. 1 does not appear to notice the affectation. ELDERLY WOMAN NO. 2 has been listening to the exchange. She chimes in from the other side of the pool. MOTHER nods. She drifts to the pool steps, exits the pool, and parks herself in the lounge chair with her thermos full of beer. Eventually, the three exit the pool area. At this juncture in my life, I find myself in the role of both home buyer and seller. As such, I feel qualified to be judgy when it comes to staging a home for prospective buyers. The MLS photos play an important role in helping buyers decide if they want to schedule a showing. Some of you have a hot mess. There is a shelf above the machines. De-clutter it, and PUT THE DETERGENT, BLEACH AND IRON THERE, FFS! What am I looking at here? A death trap? It would only take a hot second to move the coolers for the photo. Save the creative shots for your art school portfolio. It would be helpful to provide photos of the inside of the house. Looks great, right? The reality was … different. As it turns out, this was what appeared to be a frat house, complete with 30 or so liquor bottles and unwashed dishes all over these counters. 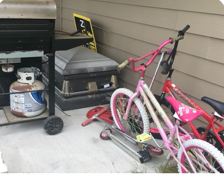 It’s a good idea to finish the yard work BEFORE you take the listing photo, especially if this is the only photo. Yes, folks, that is a coffin on the porch. No word on whether it is occupied. Thank you in advance for your renewed attention to detail (for crying out loud).